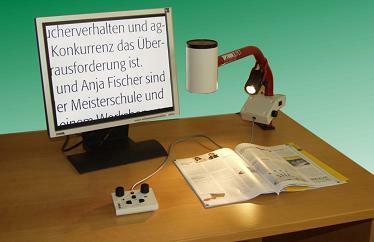 The OPTRON PCT video magnifier is state of the art technology in a new and innovative design. Whether it is used at a desk or to see the surroundings – the PCT’s superior color camera displays images with an outstanding quality. The PCT takes up a minimum of space and integrates itself perfectly into a desktop work area. It’s always there, and yet not in the way. Adjusting the PCT to the user’s individual needs is fast and easy. It offers 6 different monochrome colors, reversed polarity and a variety of other functions for optimized reading comfort. Turning the camera on the sturdy swivel arm displays the surroundings on the monitor. Blackboards, overhead projectors, flipcharts - the PCT’s infinitely variable zoom and its autofocus produce an excellent image quality in the desired size. With OPTRON’s TwistCam™-technology the camera can be rotated to almost any angle – the picture on the display is always perfectly upright and leveled. It can be used with a television or with a computer monitor. It can also be connected to a computer or to a laptop. Different models and various accessories help to find the best match of options for each user’s individual preferences. The PCT makes traveling easy. It is stored in a sturdy, hard plastic carrying case and weighs 8 pounds (without carrying case and accessories). The PCT Tray slides smoothly and accurately. It can be stopped vertically or both vertically and horizontally. The System Extension raises the camera without sacrificing stability. It also increases the reading angle and therefore depicts a larger area on the desk. The Dual Monitor Stand provides space for two screens for a maximum of enlarged information. The PCT’s Split Screen technology displays both the computer and the camera picture on the same screen. For use in a school or at a university a Second Camera can be attached to see both the blackboard and the desktop on the screen at the same time.